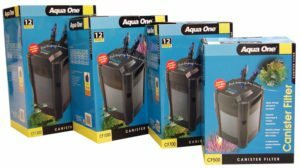 Aqua One fish tanks were first launched in the UK in 2004. they quickly became an established name on the UK Aquatic scene. With a diverse product range spanning nearly every aspect of Fish keeping from beginner to the experienced marine keeper, their aim is to become a one stop shop for all your fish keeping requirements including tanks. Below are just some of the collections they currently stock in the Aqua One Fish Tanks range. When you purchase Aqua One products you can expect to get the highest quality and reliability. We have a meticulous product testing procedure that we put each product through. This is to ensure that you are getting the best fish tank there is. They are great for whether you want to establish your new aquarium or simply upgrade your current one. Not only is the quality great, but the fish tanks themselves are stylish and complement any decor in your home. This ensures your pet has the best possible environment for them to thrive in. This is another curved glass aquarium which allows for an uninterrupted viewing. It is a beautiful tank that will complement any home’s decor. This particular set is a 55 litre 40 cm cube aquarium. There is a very easy to use the filter in the back which will house all of the technology. Should you decide you want to use this for tropical fish, a pro is that it has its own pump and heater that comes along with it. Not many aquariums offer this. This Aqua One fish tank is a beautiful aquarium that has rounded glass corners to allow for an uninterrupted viewing experience. There is also a bow front and LED lighting, this means it is low energy which is always something to consider when purchasing an aquarium. You do not want to run up your energy bill too much as this can get to be expensive. It has the technology to provide a proven trickle filter. This aquarium was launched in 2015 and is good for marine, tropical and cold water fish. The set up for this tank is relatively easy and can be done with some assistance online. You will want to be sure that you have a good place to set your aquarium first and foremost. This means an even surface that will be able to support the aquarium once it is filled with rocks and water. It is important that you consider the dimensions of the tank to ensure that you have enough space for it wherever you decide to place it. This particular tank is compact so it will be easier to find space for it, but there are certain fish you should not put in it because it is smaller. An example of this would be angelfish as they are very territorial and aggressive. 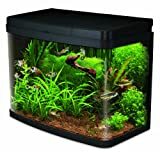 A downside to this aquarium is that it is smaller, however, if you do not plan on getting a very big aquarium, then this is not an issue you will have to concern yourself with. This particular product allows for seamless viewing with curved glass corners. This aquarium can accommodate both freshwater and tropical fish. When shopping for a fish tank, you want to be sure that you think of everything, even the lighting. This aquarium uses low energy LED lighting that beautifully lights up the aquarium as well as technology that provides an efficient trickle filter. This ensures that your fish tank always has clear water. It is important to consider how easy it is to clean your aquarium when you go to purchase one. 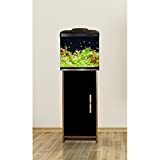 This Aqua One fish tank has media cartridges that are very easy to clean and also assist in breaking down the fish waste as well as maintaining the water quality. The lid is hinged which allows you to easily open the flap for daily feedings. You can easily add a heater which will allow for tropical fish. Things to consider when purchasing this aquarium is there have been reports of the lamination not being of the best quality and the wooden effect peeling off. In addition to this, it is a tall cabinet with no shelves. 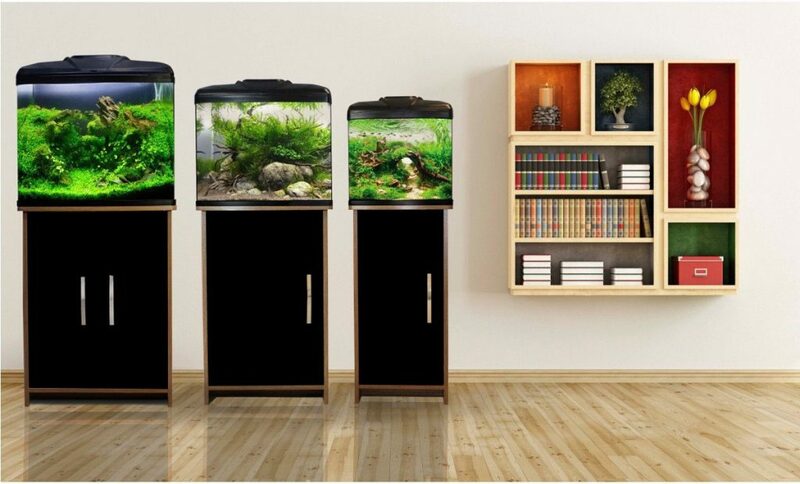 So if you are looking for an aquarium that will double as a storage area, then this may not be the one for you. We recommended that you consider the pros and cons stated about this aquarium and decide based on what you need versus what you want out of an aquarium. 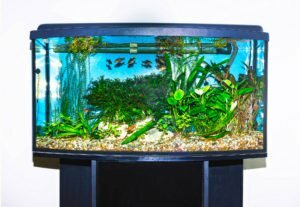 There is the perfect aquarium out there for you, but you will first need to decide what aspects of it you absolutely have to have versus things you would like to have. 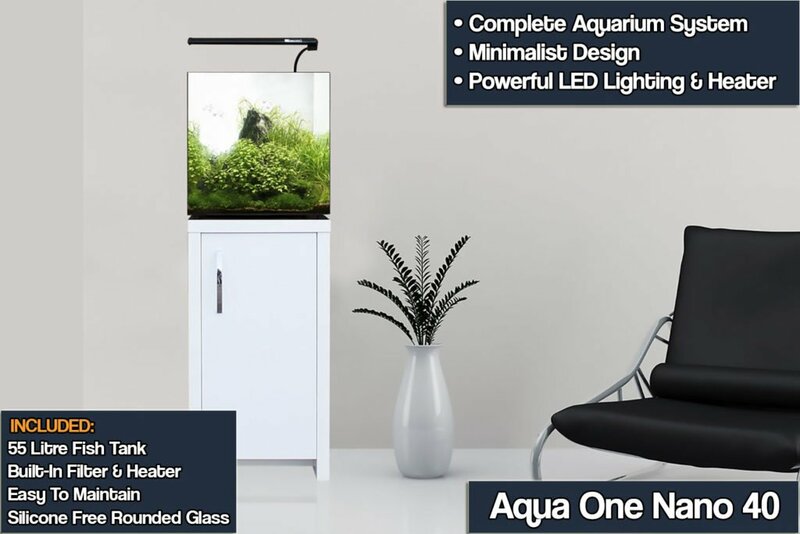 This aquarium is perfect for those who are just starting out in owning a fish tank. There is a trickle filter along with a circulation pump that goes along with this aquarium. This tank also includes LED lighting, which of course is low energy, something that is worth considering when making an aquarium purchase. A downside is that this aquarium does not come with its own heater should you want to use it for tropical fish. However, if coldwater fish is your goal, then you would not need to worry about this. This is a very easy to maintain aquarium, this is an important aspect to consider when purchasing a fish tank. Some aquariums are high maintenance and will require a lot of work to keep them maintained. If you have the time and the patience to do so, then this wouldn’t be an issue. However, first-timers and those who are busier would require a fish tank that will be easier to keep up with. This is a 28 litre tank part of the Start collection meant for beginners in fish keeping or those looking for something that does not require a large amount of maintenance. Only available in black the Aqua One 320 measures 33cm (w) x 30cm (d) x 38cm (h) and comes with a PL (Phillips Lighting) lamp built into the hood. There is also a matching cabinet for this tank with the same dimensions other than height which is 70cm. The Aqua One 320 can hold around 9 tropical and 4 cold water fish based on them being around 3cm as adults. This tank is not suitable for marine fish. This tank comes with an internal filter but no heating unit. 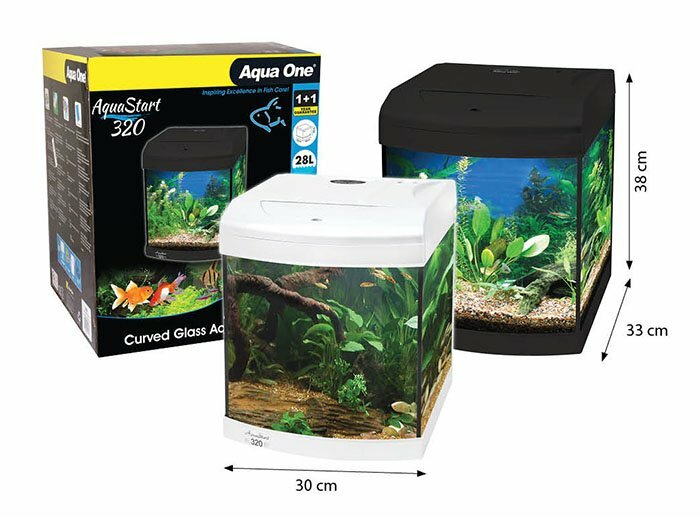 Aqua One do manufacture their own range to fit every tank they make though. You have a choice of two heaters, the Aqua One thermometer (glass) or the thermosafe which are both suitable for tanks up to 100 litre. The tank and accessories are simple to set up giving you a strong and sturdy fish tank set up that is easy to clean and maintain. It really is a perfect tank for beginners. You can also buy a range of décor for your very first fish tank from Aqua One. Backgrounds, plants, floating rocks, caves, ornaments, natural wood, coral and gravel. You want it for your tank? Aqua One probably has it. 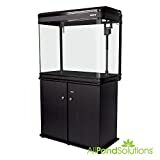 This is a great model for both price and customization, its not expensive in comparison to other tanks so it will give you a lot of options in how you want your aquarium to look when fully stocked. The 320 is a nice tank for your child’s bedroom as it can be placed on a bedside cabinet which im sure your kid will love to watch when falling asleep. The tank is only currently available to buy from stores in Australia although you may have some luck on classified websites. Starting at 65 litre tank part of the Start collection meant for beginners in fish keeping. Also part of the Start family are the 320 (28L) and the 340 (40L), although these are more square than the 500’s pronounced rectangular shape. Only available in black the Aqua One 500 measures 50cm (w) x 34 cm (d) x 49cm (h) and comes with a PL (Phillips Lighting) lamp built into the hood. There is also a matching cabinet for around £70 for this tank with the same dimensions other than height which is 72cm. Costing around £110 the Aqua One 500 can hold around 21 tropical and 10 cold water fish based on them being around 3cm as adults. For marine you should have 3 inch of fish for every square foot of tank. This tank does not come with a filter or heating unit but they do manufacture their own range to fit every tank they make. 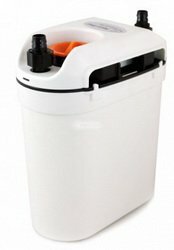 Filter wise you will something like the Aqua One Maxi 102F filtration system which is suitable for tanks up to 75 litre in capacity. Heater wise you have a choice of two, the Aqua One thermometer (glass) or the thermosafe which are both suitable for tanks up to 100 litre. is the smallest tank in the Style range. Constructed in high quality floated glass for maximum clarity and strength the curved glass to the corners provides seamless viewing. 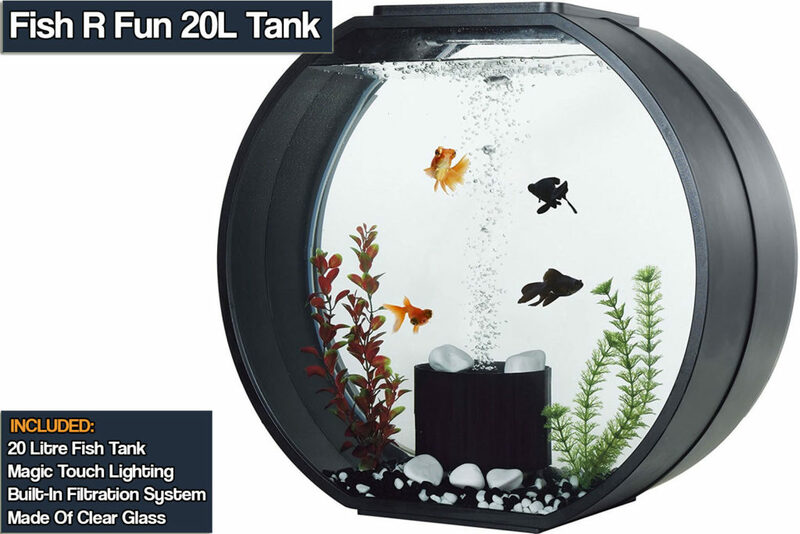 Available in black and silver the 90 litre Aqua One 620 tank measures 62cm (w) x 38cm (d) x 53cm (h). It has a matching two door oak cabinet with either black or white doors and is available to buy separately. Measurements for the cabinet are the same as the tank except it is 72cm tall. The lighting in this tank is dual spectrum T5 PL and is located in the hood of the tank. It provides adequate lighting for your aquarium however if you would like to upgrade then you can find a few options online which will work well without much effort. Filtration wise this tank uses a wet and dry system that is far more capable than internal filters. Found in the hood it provides a higher oxygen intake and to clean it all you do is open the hood, switch off the pump and remove the media cartridge and clean. You don’t even have to get your hands wet. Cost wise the Aqua One 620 is available for around £160 and can hold up to 30 tropical fish and 15 cold water fish based on a 3cm adult length. Number of marine fish would be 3 inch of fish per square foot of tank. As with the other Aqua One models this tank and cabinet does not come with a printed manual. Instead you must visit this link here and download the online PDF file, if you have access to a printer then we would recommend printing off a copy as this makes it easier to follow when building your new fish tank. The larger version of the 620 tank in the Style range. Constructed in high quality floated glass for maximum clarity and strength the curved glass to the corners provides seamless viewing. this is not a small tank, its the type that can be the center piece of any room or office its placed in. Available in black and silver the 130 litre Aqua One 620 tank measures 62cm (w) x 38cm (d) x 72cm (h). It has a matching two door with either black or white doors and is available to buy separately. Measurements for the cabinet are the same as the tank. The lighting in this tank is dual spectrum T5 PL and is located in the hood of the tank. Filtration wise this tank uses a wet and dry system that is far more capable than internal filters. Found in the hood it provides a higher oxygen intake and to clean it all you do is open the hood, switch off the pump and remove the media cartridge and clean. You don’t even have to get your hands wet. Extremely easy and loved by a lot of fish keeping hobbyists. Cost wise the Aqua One 620T is available for around £210 and can hold up to 43 tropical fish and 21 cold water fish based on a 3cm adult length. Number of marine fish would be 3 inch of fish per square foot of tank. We would recommend taking some time planning on which stock you would like for a tank as large is this as once its filled you wont want to change things around too much. is part of the Style range. Constructed in high quality floated glass for maximum clarity and strength the curved glass to the corners provides seamless viewing. 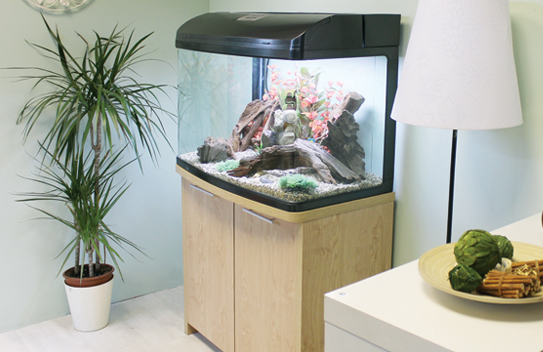 Available in black and white the 165 litre Aqua One 850 tank measures 84cm (w) x 44cm (d) x 58cm (h). It has a matching two door oak cabinet with either black or white doors and is available to buy separately. Measurements for the cabinet are the same as the tank except it is 72cm tall. The lighting in this tank is reflector lighting with 2 x 25 watt and 1 x 20 watt light. This is located in the tanks hood and gives off enough light to properly illuminate your fishes enviroment. Filtration wise this tank uses a wet and dry system that is far more capable than internal filters. Found in the hood it provides a higher oxygen intake and a dry hand way of cleaning. All you do is open the hood, switch off the pump and remove the media cartridge and clean. Cost wise the Aqua One 850 is available for around £239 and can hold up to 55 tropical fish and 27 cold water fish based on a 3cm adult length. Number of marine fish would be 3 inch of fish per square foot of tank. Second hand deals can be had easily online, you will find the average price being round £170+ depending on condition. The only problem with this tank is that it does not come with any instructions so you will have to visit their website to download the online manual. The 850 is a great sized tank for those who are experienced in looking after fish tanks as 55 fish is a rather large amount to look after and maintain. Those who are new to the hobby we would recommend looking at a smaller fish tank. is part of a range that says it all – style. With contemporary visual appeal, great build quality, curved glass to the corners and the highly efficient wet and dry filtration system the 980 will take some beating. Available in black and silver the 215 litre Aqua One 980 tank measures 99cm (w) x 47cm (d) x 60cm (h) and has a matching two door cabinet available to buy separately. Measurements for this are as the tank except it is 76cm tall. Lighting is supplied with the dual spectrum T5 PL (phillips lighting) which comes with 2 x 30 watt and 1 x 25 watt strip light. Lighting is built into the hood. Cost wise the Aqua One 980 is available for around £300 new and can hold up to 71 tropical fish and 35 cold water fish based on a 3cm adult length. Number of marine fish would be 3 inch of fish per square foot of tank. 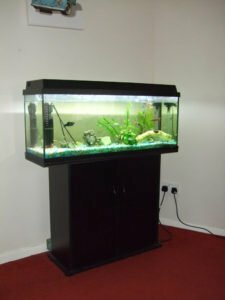 If you are looking to pick up a deal, you could pick up a second hand tank with everything included for under £300, the only downfall to this is arranging delivery to your home address. The only downside to this tank is that it does not come with any instructions and unless you know that you can download them directly from the Aqua One website, it could be very frustrating. Click here to download the set up guide. 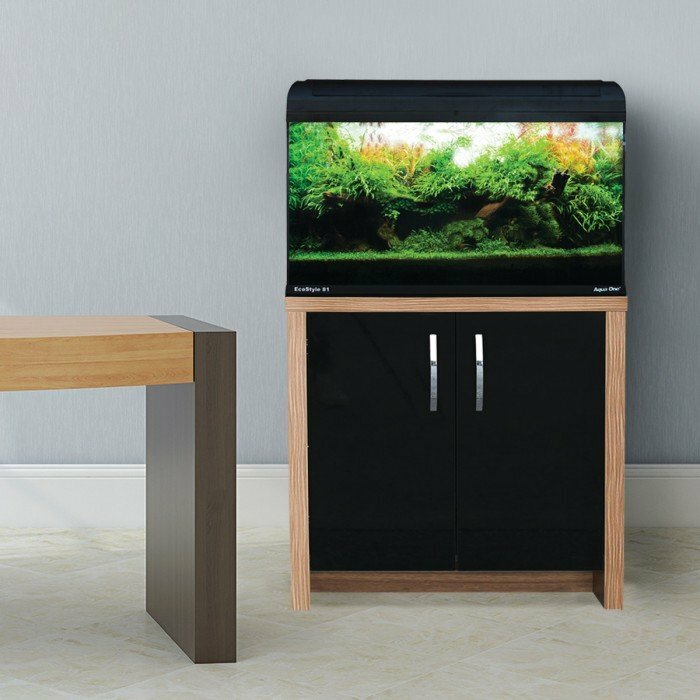 We recommend buying an official cabinet for your new Aqua One 980 tank, a good place to look is second hand websites like gumtree, ebay or your local fish store classifieds. Is part of the Reef collection which has been purpose designed and built as salt water tanks. This 300 litre tank is made of plastic, glass and alloy to ensure it is impervious to the effects of salt. Available in black and white the Aqua One Reef 300 measures 102cm (w) x 52cm (d) x 73cm (h) and is absolutely stunning with its white opti glass and chic styling together with a matching two handled cabinet. This tank comes complete with: built in sump, pipe work, filtration media, heart, protein skimmer, circulation pump and Quadrolite 4 tube T5 lighting system. 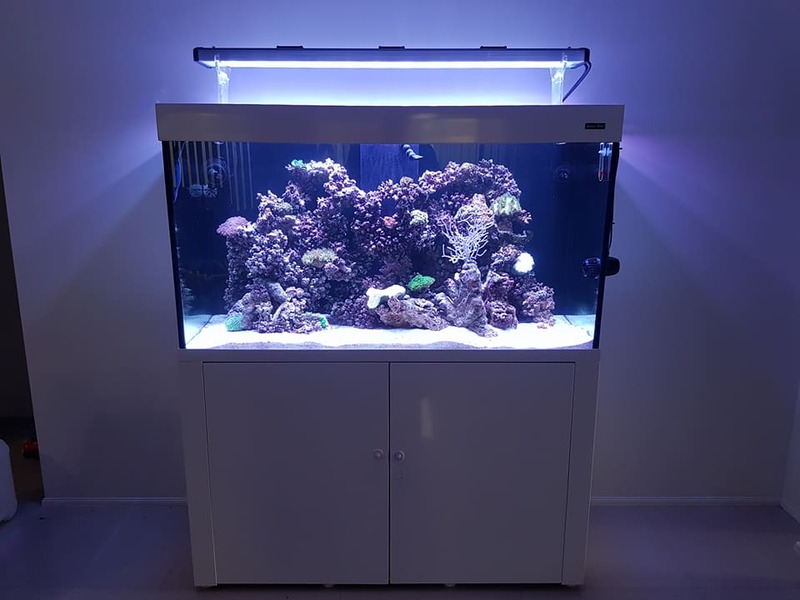 If you plan on using the Aqua One Reef 300 as a marine tank there are lots of beautiful marine fish out there such as: the sunset butterfly fish, the jewelled moray eel, Antennata Lionfish and the marine Betta. You can have 3 inch of marine fish for every square foot of tank. At just under 8 foot square this is around 31 3 inch fish in this particular tank. Used as a general tropical tank it would hold around 100 fish and as a cold water tank 50. Aqua One also sell a fantastic range of décor for your fish tank including: vibrance plants, floating rocks, plant life, stones, corals, gravel, caves, ornaments, natural wood and backgrounds. 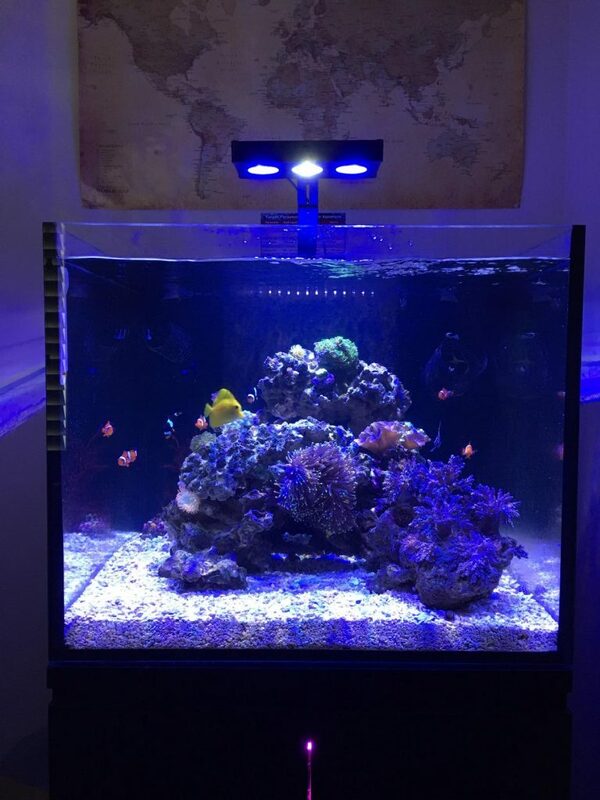 Décor matched well with your fish will make your reef 300 a beautiful display. It also benefits the fish to have hiding places, plants to nibble on and rocks to rest on. really does look like something from the space age. 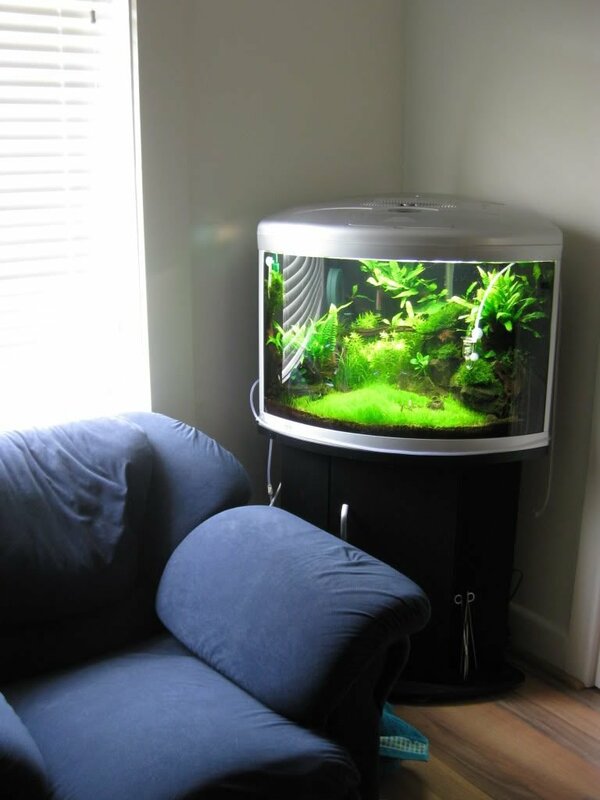 Closely resembling the look of a flat screen television, it is actually a space saving corner fish tank. Measuring 86cm (w) x 55cm (d) x 62cm (h) it will comfortably look at home even in the smallest of rooms. This tank is fitted with the wet and dry filtration system which is located in the slim line hood reserving more space in the tank for fish. It also being an external filter has a higher intake of oxygen making it more efficient than internal filters. It does not come with a heater so if you are going for a tropical tank you will need to buy either the thermosafe or glass thermometer suitable for a 100 litre tank. A 100 litre tank will have the capacity for 33 tropical and 15 cold water fish. This is based on adult fish of 3cm. To go with the sci-fi looks of the Aqua One UFO 550 you could opt to go for a space age themed décor. You can do this by choosing Aqua one caves, vibrant plants and floating rocks. The caves are available in rounded marble and granite and square granite. They come in several sizes and look fantastic stacked. To go with the stone and space theme you could then add the floating rocks available in small, medium and large. These attach to the bottom of your tank with a suction cup and due to invisible wires really do appear to be defying gravity. Finally add some vibrant colour in the form of bright orange, blue, purple, yellow, red and pink vibrant plants. Buy this tank and you really will be the envy of all your fish keeping friends. This tank and cabinet are not the cheapest option but certainly one of the most stunning options available. Aqua One has two ranges of filters in both external and internal filtration systems. All you have to do is pick the most suitable for you. Aqua One Filters Internal Filters and Aqua One Filters Maxi Internal Filters. Internal filters are generally cheaper and run quieter as they are placed inside a body of water, however if your tank is small then you may find yourself trying to balance having a nice looking tank versus a bare minimum glass tank. A lot of fish owners actually prefer to use an external filter as they can install it out of side either inside their cabinet or around the back on the floor. We will take a look at some of the features, sizes and power outputs for the various aqua one internal filters currently available online. With the information above you should be able to make an informed decision on which one is best for you. If you are still unsure then we would recommend talking with a fish specialist perhaps in your local store or one of the great large communities online. A fish tank whilst made as natural as possible is always going to be an artificial home for your fish. This means that they are always going to need technological help to do what free running water would in a fish’s natural environment. Thankfully the Aqua One External Filter makes the job of creating a “natural” environment easy. Filters are that technological aid that will maintain healthy water conditions where your fish can survive and flourish. It will also remove waste and break it down stopping it from becoming potentially toxic. Having the correct filter for your Aqua One fish tank is important for your fishes health and we recommend you take the time to get the correct model for your aquarium. Having to change out filters midway through stocking your tank can be a real pain and take away from the enjoyment from owning your own small. We hope the information above will help guide you to buying the correct filter, if you need any more information please feel free to email our team for assistance. So you want to get a fish tank! It’s a very exciting choice. No matter whether you choose a freshwater or saltwater aquarium, having a fish tank in your space is sure to give you entertainment and peace for many years to come. 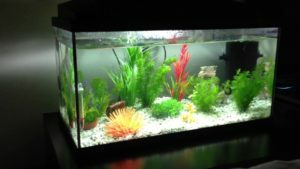 However, as you’ve begun shopping and planning for your fish tank, you’ve probably realized that there are more 20 gallon fish tanks out there than you first realized. With so many options, how do you choose the right one? Not to worry. 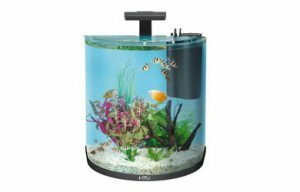 In this article, we’ll provide you with a brief guide to the ten best 20 gallon fish tanks on the market right now. Read on to discover the fish tank that’s right for you. This starter kit is a great option for beginner fish tank owners. It’s relatively easy to set up and use. Plus, this tank is equipped with an Aqueon QuietFlow filter that provides filtration in four stages. This helps to ensure crystal clear water for healthy and thriving fish. The LED system offers white light to illuminate your tank and the kit comes with all kinds of little samples you may need. The Aqueon Team have thought of everything that a beginner would need. They have also included a very handy filter that has a patent pending LED on top which will let you know the perfect time to change the cartridge! This kit comes with everything you may need to get your 20 gallon fish tanks adventure started. One of the coolest features is that this tank has LED lighting built into the lid. You can even choose between three different lighting styles, from daylight to cool moonlight. 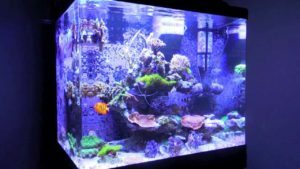 It can work as a freshwater or saltwater tank, though the lights built in will prevent coral growth if you go the saltwater route. More information on their fantastic LED system can be found here. This is one of the coolest 20 gallon fish tanks out there. Plus, Tetra is well known in the fish tank world for reliable quality and great products. This tank has a Whisper filtration system that will keep your water clean using a three-stage filtration process: filter floss, activated carbon, and Biofoam. In addition, the ColorFusion model will cycle through different lighting colours or let you choose just one to illuminate your tank. The LED lighting system in this tank mimics natural daylight, providing a calming atmosphere for both you and your fish. A clip-on filter makes filter changing easy, and you’ll also receive a fish net and fish food samples in the box. Another reason people love this tank is that it includes Nutrafin Cycle, which introduces healthy bacteria to your tank without you having to stock it yourself. Another Marineland tank makes the top ten list. This glass tank is shaped like a half moon, creating a visually appealing way to display your fish. 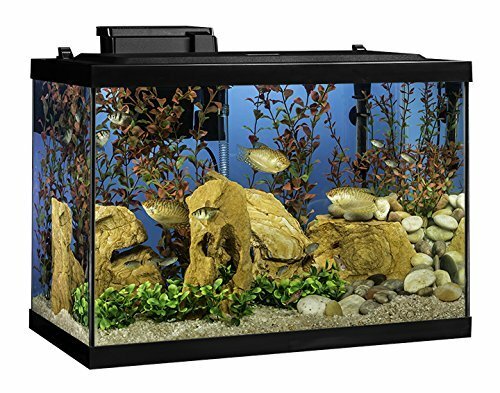 The seamless 180-degree view you get with this design makes it a common favourite among fish tank enthusiasts. Your fish will swim on by in a sort of bubble-shaped just for your viewing pleasure. 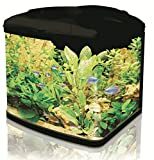 You can customize the lighting of this tank and there is a hole on top of the lid for feeding your fish easily. This aquarium is extremely easy to get up and running. The electric fixture that comes with the tank is needed to ensure photosynthesis and proper growth of the aquatic plants in your aquarium. The beautiful yet simple design of this tank makes it appealing to novice fish tankers and experienced owners alike. The coolest thing about this Tetra tank is the 13-inch Glofish stick. It glows fluorescent and basically throws a rave inside your fish tank. You and your tropical fish tank residents will be enjoying a hopping glow in the dark party every night as they swim and shimmer under the black light. The tank also comes with Glofish plants for your tank, like aquatic plants and an anemone, that will truly make your tank design shine. They’ll glow in the dark and really impress anyone who sees your tank. Usually, 20 gallon fish tanks have a square or mostly square shape. Seeing a long rectangular tank is much less common. However, that’s exactly the appeal of this tank. Because it is 30 inches long, it’s a bit less deep and less wide than most other tanks. You’ll be able to see your fish easily, because there are fewer places for them to hide in this stretched out tank. Okay, so this tank is just shy of 20 gallons at a mere 16 gallons, but the cool factor far outweighs its slightly lower volume. The BioCube is a small and uniquely shaped cube like tank that is designed to function as a miniature marine sanctuary. It can maintain an entire reef environment within its four symmetrical walls. Perhaps the coolest part is the integrated timer. You can program the tank to display a 30-minute sunrise/sunset or a 60-minute moonrise/moonset simulation. This kit is best for saltwater hobbyists and is a bit more expensive than other starter kits. This kit is also slightly off of the 20 gallon mark at 23 gallons, but its seamless sweeping design makes it one of the most loved tanks out there. The built-in lighting system consists of a soft start lamp that takes some time to reach full brightness. This slow progression helps to minimize the initial light shock of the day to your fish. The tank also comes with a heater and thermometer, and is recommended for freshwater use only. If you’re on the hunt for the perfect 20 gallon fish tanks for you, we have good news. On this site, we can answer that. You’ll also find everything you ever wanted to know about the care and keeping of a marvellous fish tank. From cleaning tips to fish tank reviews, we’ve got you covered. Now that we’ve got that handled, we want to hear about your fish tank experience. 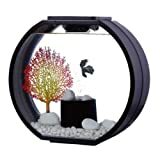 Have you tried any of the 20 gallon fish tanks listed above? How’d you like them? 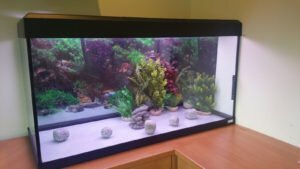 Considering a 50 litre fish tank purchase? Well here’s some tips on what you should be looking for. Apparatus wise the 50 litre tank can be a reasonably priced option to go for. If you buy a ‘ready to go’ tank that includes lighting, heater and filter it can cost you anywhere from £60 upwards. This is dependent on tank shape, oblong usually being the cheapest whilst orbs, hexagons, corner tanks are more expensive. If you choose to go the route of buying everything separately it can be more expensive dependent on what you decide to buy. A heater is vital if you are going the tropical route but not needed for cold water tanks. Heaters for this size tank should be between 25 watt and 50 watt and range from £15 upwards. Lighting is optional and 99% of the time only there to improve our view of the fish and serves no benefit to them at all. As a rule lighting should be about 1-2 watts per 4.5 litres of water in your tank. The cost will depend on what lighting you choose. Smaller fish tanks such as the 50 litre are well suited to the easier to look after less active fish such as neon tetras, dwarf catfish, dwarf crayfish, Siamese fighting fish and shrimp. As a rough guide you can have 1cm of fish per litre of water equalling approximately 17 fish at 3cm adult length. 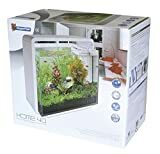 This equates to the 50 litre fish tank being a really good place to start in fish keeping for a beginner, or for those who want an easy care tank for their fish whilst still having the capacity for a plentiful amount and range. A 90 litre tank may seem small for a marine (saltwater) tank and it is considering how many marine fish you can actually put in one. Based on the rule of thumb that you can have 3 inch of marine fish per square foot of tank, an average 90 litre fish tank would only hold two. However if you wish to or are considering concentrating on something other than fish in a marine tank, it’s a good size to practice / start with. There are all sorts of things you can keep in a 90 litre fish tank other than fish including live plants, live corals, natural rocks and wood and invertebrates. The latter is an interesting and varied choice! For the beginner it may seem like a large ask but actually there are plenty of marine invertebrates out there that are easy to look after and interesting to keep. These include; banded coral shrimp, blood red fire shrimp, blue tuxedo urchin, brittle sea star, bumble bee snail, feather duster, various crabs and spiny star Astraea. Invertebrates to avoid are; sea slugs, strawberry cauliflower coral, feather star, venomous sea urchins, carpet sea anemone, large hermit crab, sponges, blue ring octopus, sea apple and green brittle star. It should be noted that if you decide to keep a crab in your marine tank that most do like to go on land occasionally as well as be in water. This can be easily achieved by piling substrate up against the side of the tank so that it creates an area of land for your crab. Ensure that you have a well-fitting cover for your tank if you opt to keep a nipper as they can be quite the sneaky escape artist. A good model to look for is the Fluval Roma 90 which comes with everything you need to get your new aquarium up and running in no time. A 20 Litre Fish Tank may seem a little on the petite side but if you are limited for space, money or time to look after your fish it could be the ideal tank for you. The cost of a complete set up of this size tank including: tank, lighting, heating, filter, substrate (gravel), live plants / fake plants, food, ornaments and water conditioner can be seen here. Shapes such as corner tanks, hexagons and orbs could be substantially more. The cost of fish will depend on which fish you pick and how many you put in. A guideline for a tank of this size is 22cm of fish, 1cm of fish per litre. Fish such as eels which are long but very skinny you can just count a ¼ of their length and fatter or taller fish such as angels and puffer should be counted as 1 ¼ times their length. A suggestion for optimum beauty with relatively low cost on stocking of your tank would be to have a Siamese fighting fish as your main attraction. Native to Thailand these fish are incredibly beautiful with their showy fins and tail. Available in all different colours ranging from pearlescent to bright red and electric blue they can be mixed with plainer fish to make them stand out or other brightly coloured ones to clash vibrantly. It is only suggested you put another six fish (up to 4cm in length fully grown) in with a fighter fish. You could also add two shrimp or a snail to clean the bottom of the tank, but not catfish, they take up to much capacity in a 20 litre tank. 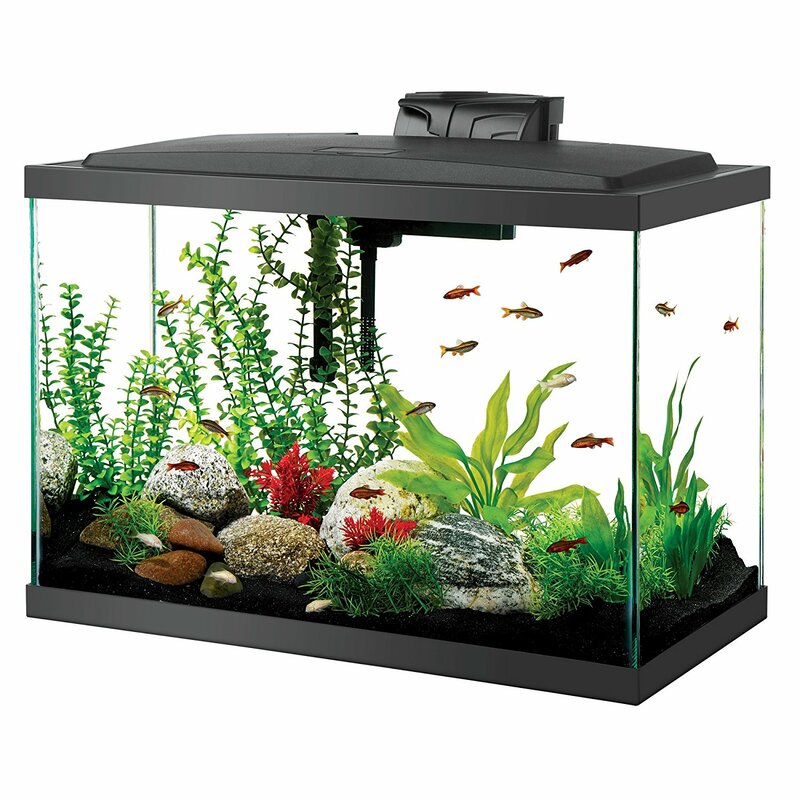 A 20 litre fish tank is a great starter tank for beginners, busy people or young children. It gives you a chance to appreciate the hobby of keeping and looking after fish. Of course if you are looking for a larger tank then we would highly recommend looking at the 40 to 45 litre range of fish tanks currently available. 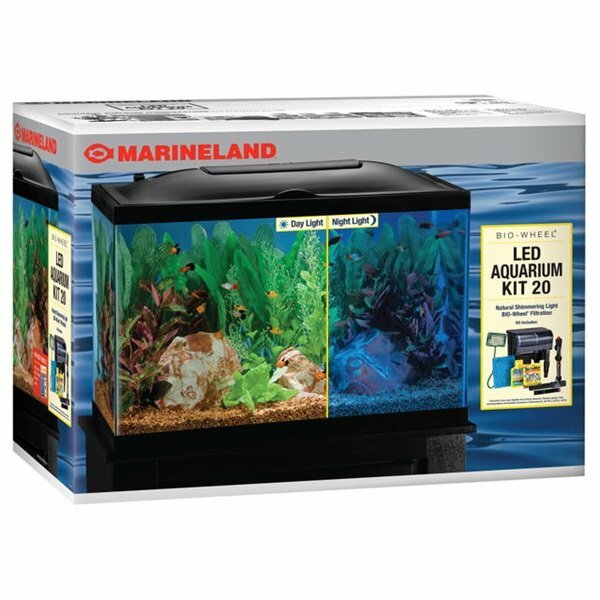 Costing around £600 upwards a 300 litre fish tank kit (including heater, lighting and pump) is not a cheap option. Nor is it probably suitable for a beginner in keeping an aquarium. It is however a vast space for you to display a beautiful array of fish, approximately the rule of thumb is 60 tropical or 30 cold water at 5cm fully grown. The fish you choose will then want places to hide and swim through that are preferably as close to their natural habitat as possible. If you want to give them this then a 300 litre tank is a good place to do it. You don’t need to buy rocks or wood for your tank, besides they are rarely sold big enough for a tank of this magnitude. Instead go out and find large, crazily shaped chunks of driftwood and rock and place them in your tank as randomly, nature is random after all, as possible. Dimensions: 1229(L) x 434(W) x 730mm / 48" x 17" x 29"
Cabinet Dimensions: 1229 x 434 x 705 mm / 48" x 17" x 27.7"
Recommended rocks and wood are: limestone, slate, texas holey rock, pumice, lava rock, quartz, petrified wood, lace rock, sandstone, driftwood, bogwood and mopani wood. Benefits aside from the aesthetics of natural rock and wood are that some fish eat algae off rocks and wood. Providing a source for this will not only give your fish a healthy diet that is natural, but will encourage them to behave instinctively. Rocks and wood also help eradicate ammonia and nitrates from your 300 litre fish tank, both of these are toxic to fish. Taking on the task of buying, setting up, filling and maintaining a 300 Litre Fish Tank may seem like a daunting task for most people but thanks to the internet its rather easy. Many websites and youtube videos can help walk you through the process and we highly recommend you take the time to do so as the cost of buying everything will add up. If you choose to set up a 125 litre fish tank as a marine environment there are certain things that are imperative to its success. One of them is live coral without which your marine aquarium may not survive. The reason that they are so important is that you need to recreate natural conditions of the ocean in a marine tank. As salt water and coral do not make for entirely natural conditions of the ocean you will need to place some additives in the tank that will provide a constant source of vital nutrients to your corals. Many supplements are available; just pick the one that best suits the type of coral you have in your tank. If you are a beginner at keeping a marine tank you will be best picking corals for your level of experience. These include: red candy cap coral, lemon tree, blue ridge, lavender mushroom, button polyp and colony polyp. For advanced marine fish keepers you could choose nano corals, hard corals, mushroom corals, soft corals, polyps and sea fans. Placement of live coral is important as they can be sharp and can injure the fish in your tank. Be careful of your placement and be prepared to move your coral if necessary. 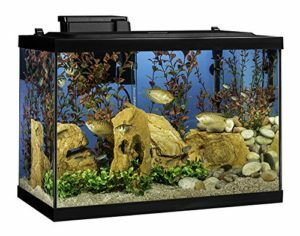 There are a few very popular 125 litre fish tank models which we have listed below, these tanks have a large following online and great after support so there is no need to worry about being left in the dark if you run into difficulties. 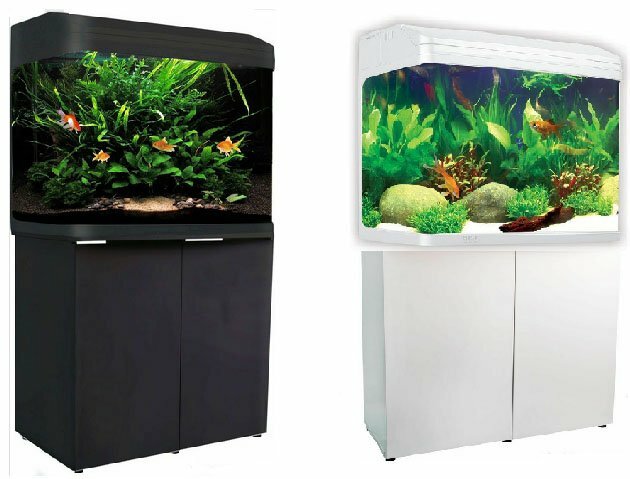 The 125 litre fish tank range is a great size to have, looking online it seems to be one of the most popular sizes for homes in the UK. Stocking a 125 litre aquarium will give you a lot of options, a nice mixture would possibly be some asian fish such as the sparkling gourami, pearl gourami maybe a few chilli rasbora’s. 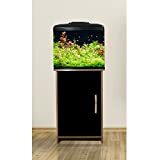 Whether you are looking for a child’s first fish tank or just an easy to maintain tank for yourself the 30 litre fish tank is a good option. It only has the capacity for five cold water fish but choose the right fish and it could be stunning. It is also a good number of fish for easy maintenance. When setting up the tank you will need lighting, a filtration system, gravel, plants and ornaments. Lighting should be 1-2 watts per litre of water equating to 30 watts of lighting. Plants are better live as they provide oxygen to the tank whilst removing harmful elements. Children though may prefer the vibrant and bright colours of the fake plants and if so perhaps you could mix the two together, the best of both worlds so to speak. Ornament wise there are plenty of options out there especially for children who will love to pick from the themes. Football, shipwrecks, unicorns, princesses, cricket; there are plenty of options out there. Some fish suggestions are goldfish of which there are plenty of varieties out there. They can be messy eaters though and will require a 10 percent water change and clean every week. Blood fin Tetras with their silver bodies and red fins are also another good choice that can live up to ten years. These fish like to live in groups and are extremely active. There are also some barbs, guppies, Tetras and loaches that would be suitable too. It is advisable to have a bottom feeder also to clean the bottom of the tank. Why not try snails or shrimp! If you believe a 30 litre fish tank may be too big for your child or your space in your home then we recommend starting with a smaller tank. The benefit of these small tanks are price, maintenance and of course not having to carry a heavy awkward glass tank around your home! The average 200 litre fish tank measures around six square feet making it an ideal home for marine fish and all that can go with a tank of this type. Its capacity means that you can have around eighteen fish based on 3 inch of fish per litre of tank. That is assuming the fish you choose are of 3 inch length at adulthood. You will need to adjust the amount if you choose fish of a larger or smaller size. There are various fish suitable in the three-inch at adult range such as: Clownfish, Blenny’s, fire fish, hawk fish, dotty backs, damsel fish, Wrasse and goby’s. You could also add marine invertebrates like brittle sea stars, Bumble bee snails, crabs, feather dusters, coral shrimp and fire shrimp. Your 200 litre tank could be a real plethora of marine life. Marine tanks do need live rock and it is recommended that you do not set up a tank of this kind without them. They are not cheap ranging from £35 to £115 but they are beautiful and provide a natural source of filtration. Available in a few varieties and colours such as green, purple, red and yellow they are a vibrant way of decorating your tank whilst maintaining its health. You may also choose to add live corals but be aware that you need to recreate natural conditions for them to live. Many supplements are available to do this. Coral varieties include: candy caps, polyps, sea fans and mushrooms. Owning a 200 Litre fish tank is not recommend for beginners, not only do they require a lot of set up time, they need constant monitoring and maintenance to keep your fish in prime health. Thankfully the internet has a large community of aquarium owners so getting advice on owning and running your own 200 litre tank can be made a lot easier.